November 27 W. Oak St.
Kristi M. Witkosky, 32, of Villas was arrested by Ofc. John Mooney for DWI on November 24. Arpan M. Shah, 29, of Galloway was arrested by Ofc. Ronald Gorneau for DWI and criminal mischief on November 26. Brunilda Santiago, 44 , of Somers Point was arrested by Det. Jason Kiamos for criminal mischief on November 26. Timothy R. Musso, 42, of Galloway was arrested by Ofc. Justin Butler for criminal mischief on November 26. Albert T. Daughtery, 46, of Galloway was arrested by Ofc. Pat Neal for aggravated assault , terrorist threats and possession of weapons on November27. 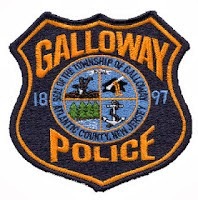 Anne Louise Peifer, 50, of Galloway was arrested by Ofc. Kevin Welsh for DWI on November 28. Byron L. White, 32, of Newtonville was arrested by Det. Jason Kiamos and Det. Bryan Casey for theft on November 29. Omar T. Chapman, 38, of Galloway was arrested by Ofc. Scott Winneberger for burglary, theft and contempt on November 29. Ashley N. Catts, 19, of Hamilton Twp. was arrested by Ofc. Kyle Kuhar for possession of more than 50 grams of marijuana on November 29. Linda M. Evangelista, 34, of Linwood was arrested by Det. Ryan Goehringer for fugitive from justice on November 29. Hector G. Matos, 23, of Hamilton Twp. was arrested by Ofc. Justin Butler for hindering apprehension on November 29. Alexa L. Seaman, 23, of Spotswood, NJ was arrested by Det. Bryan Casey for prostitution on November 30. Naeem H. Closs, 32, of Galloway was arrested by Ofc. Jacqueline Crocker for hindering apprehension on November 30.